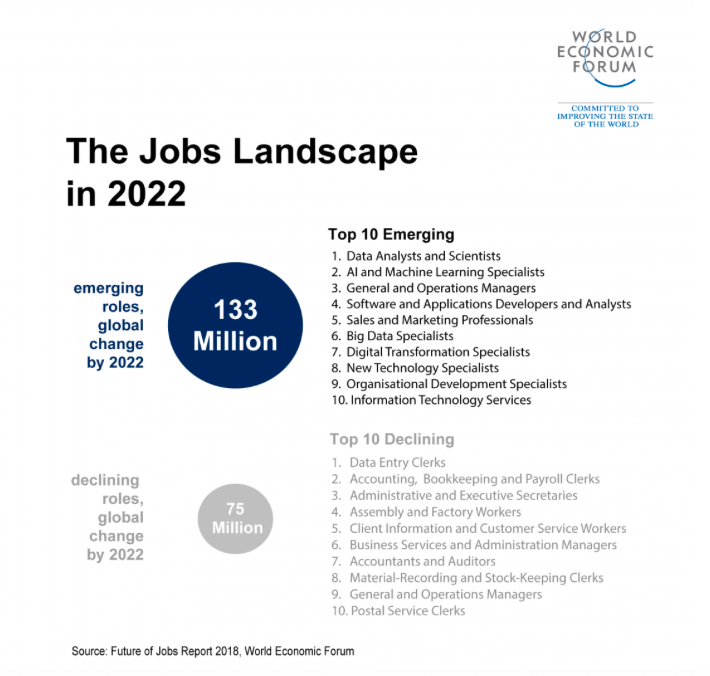 Machines and algorithms will do more current tasks than humans by 2025, according to the World Economic Forum’s Future of Jobs Report 2018, which covers 20 economies and 12 industries. But this robot revolution will still create 58 million net new jobs in the next five years, the same research has found. Based on the operational realities of those at the frontlines of deciding on how to develop technological and human capital at the largest global companies in the world, the report aims to provide a nuanced, realistic view of the near future of work. Unlike long-term predictions and scenarios, a focus on the near term forces us to consider what we must do today to create the future we want. 1. In 2013, Italy’s key motorsport manufacturing companies – Ferrari, Maserati, Lamborghini and Dallara – were facing significant skills shortages while declining sectors – including the local textiles industry – were shedding jobs. To solve the problem, the motorsport companies partnered with each other and with the ManpowerGroup to retrain the displaced workers with new, in-demand skills. These workers went on to hold a diverse set of roles in the motorsport industry – as carbon-fibre laminators and fitters, aerodynamics engineers, vehicle performance analysts and chassis developers, as well as interns, project managers, HR and IT specialists – with an average wage increase of 30%. There are four essential conditions in this example of a successful transition – for workers and employers alike. The first is that competitors in the same industry chose to work with each other to create a new pool of talent. Next, the government provided proactive support, and a third party with cutting-edge information on skills and jobs provided a coordinating function. Finally, relevant training and skilling services were available locally and online. More collaborations like these, repeated across industries and geographies, will be fundamental for proactively shaping the future of work we want. But they remain rare – and the window for us to act is closing fast. 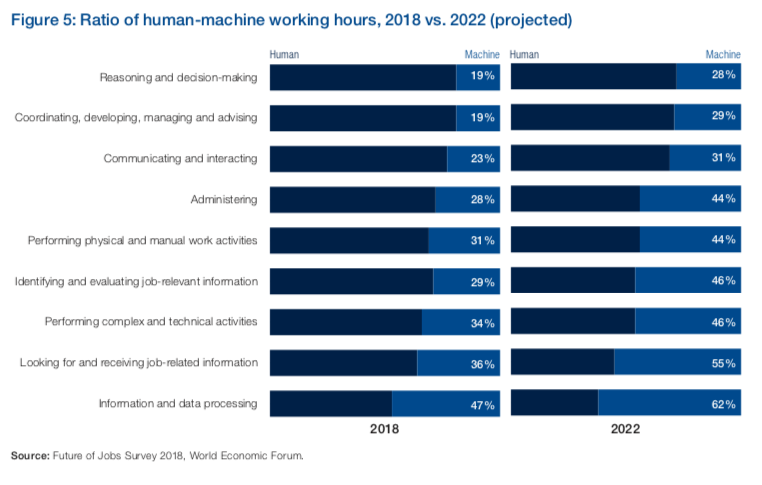 By 2022, for tasks such as information and data processing, machines will for the first time surpass humans in working the number of task-hours required. Even in functions like reasoning and decision-making, the most human of functions at present, machines will take over 28% of total task-hours, compared to 19% today. However, the majority of companies predict that this automation will be offset by growth in new roles. In their view, technology creates new jobs that play to the comparative advantage of human skills, augmented by machines. There are also important socio-economic and demographic factors, such as rising middle-class demand in emerging markets, and the leisure and healthcare needs of ageing societies in many advanced economies. But even as the overall pie gets bigger – our estimates suggest 133 million new jobs offsetting a decline of 75 million – it is clear that managing these structural shifts require vastly improved coordination between workers, employers and policy-makers. If managed wisely, these transformations could lead to a new age of good work, good jobs and improved quality of life for all, but if managed poorly, they pose the risk of widening skills gaps, greater inequality and broader polarization. What needs to happen today to manage the transitions expected in the next five years? Here are five conditions for creating a positive future of work. 1. Industries need a shared approach to managing workforce transformations. 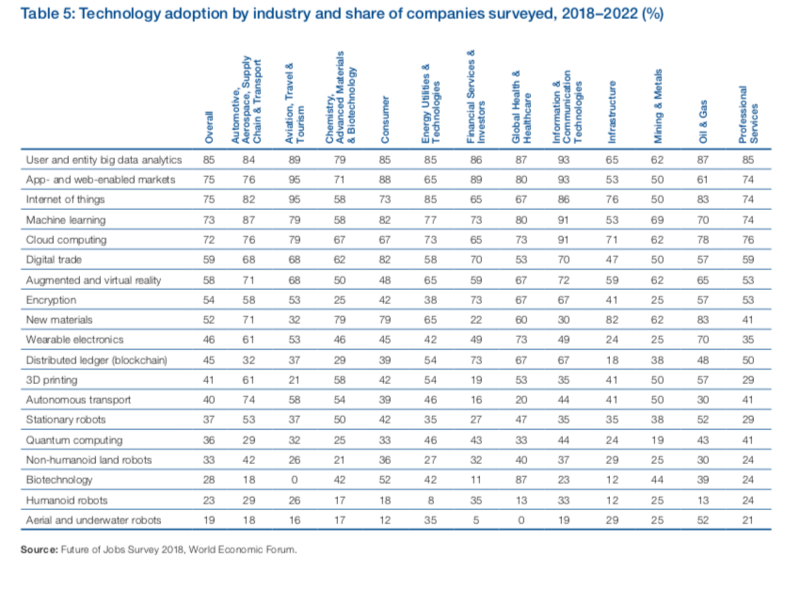 Technology adoption looks very different across different industries. For example, while companies in every industry are considering introducing some use of wearable electronics in the next 5 years, in the health and healthcare industry over 70% of companies have such plans. In the infrastructure industry, less than a quarter of companies plan to do so. The subsequent consequences for workers are very different. How then can industries – and their workers – prepare? Each industry needs its own roadmap, using industry-level data on which roles are expected to grow or decline to develop customized methods for addressing their talent needs. While more than half of all employees will require significant re- and upskilling, most employers plan to focus their efforts on a few high-value roles rather than those at risk of displacement, due to cost concerns. For a single company large-scale talent development, reskilling and upskilling may not be affordable – but for a consortium of companies from an industry, costs can be low enough to make collaboration rather than competition for talent worthwhile, like the collaborative approach used in Italy. 2. Businesses must define their companies’ augmentation strategy. While skills such as technology design and programming will continue to grow in demand, so will ‘human’ skills such as creativity, originality and initiative, critical thinking, persuasion and negotiation, attention to detail, resilience, flexibility, complex problem-solving, emotional intelligence, leadership, social influence, and service orientation. This is not surprising – for many companies, after an initial wave of labour-displacing, cost-cutting technologies, their future growth depends on creating new and differentiated products and services that tap into human skills. But for the concept of augmentation to go beyond a euphemism for simple automation, the human capital of companies can no longer be a liability but an asset. Together with other executives, chief human resources officers must be the new leaders at the frontlines of driving growth by creating a human-machine augmentation strategy for their organizations. 3. Governments must activate modern labour market policies. Global average skills stability—the proportion of core skills required to perform a job that will remain the same—is expected to be about 58%, meaning an average shift of 42% in required workforce skills over the 2018–2022 period. For someone who is likely to stay employed in their current role in the white collar workforce, this means on average 101 days of reskilling. But for those who are likely to be fully displaced, the average time for reskilling towards a better paid role may be 2 years or longer. For 70% of displaced workers, their new role is going to come from outside their current industry. These are daunting challenges and it is critical that governments play a proactive role in addressing them. Such policies for the modern labour market range from improving job centres, to developing income safety nets, to considering individual training accounts, to building an ecosystem for public and privately provided retaining, to new policies for online work. 4. Policymakers and investors need to consider a new approach to job creation in the Fourth Industrial Revolution (4IR).Complementing the growth expected from technological change, the education, green energy, care, leisure and health sectors are expected to expand due to demand in developing and developed countries alike. Across all industries, among the roles that are expected to grow significantly by 2022 are those leveraging technology. These include data analysts and scientists, software and applications developers, ecommerce and social media specialists, AI and machine learning specialists, big data specialists, information security analysts and robotics engineers. But there is also much potential in roles that leverage distinctively “human” traits, such as customer service, sales and marketing, training and development, people and culture, innovation management and organizational development. This is a unique window of opportunity. Governments will need to create the right incentives through an investment and entrepreneurship framework that systematically channels the right kind of job creation– a new approach to “industrial policy” in the Fourth Industrial Revolution. 5. All stakeholders need a common language for defining and assessing skills.For the last century, diplomas and degrees – and the institutions that issue them – have served as proxies for the applicable skills that people actually hold, especially in the white-collar workforce. In a labour market where there was relative stability, this system, while not ideal, largely worked. Today, however, education systems are often missing the practical skills needed in the workplace. Even when this is not the case, workforce needs change too fast for one degree to last across a decades-long career. Instead, we need to develop a common pooled taxonomy around talent to understand what constitutes a skill, a competency, an ability or a trait – and how to assess it. Such a taxonomy can serve as a basis for an agile, transferable approach to degrees, diplomas, certifications, micro-credentials, recruiting and staffing. Creating this information symmetry can lead to a more efficient, transparent, and dynamic labour and education market – and introduce new, more meritocratic paths to social mobility in society. None of the proposals above are easy to implement. Each requires complex coordination across multiple stakeholders. Most need new forms of currently private data to become public.Some are bound to fail. But if successful, they have the power to change the trajectory of millions of lives for the better and power new growth in our economies. At the World Economic Forum’s Centre for the New Economy and Society, we are working on each of these areas, driving forward new ways of thinking and providing a platform to those who want to implement the most forward-looking experiments. These agile approaches to developing solutions, borrowing from the experimental methods used in creating the very same technologies that are disrupting our workplaces today, are necessary for ensuring that we harness the Fourth Industrial Revolution for inclusive – and dynamic – economies.